Hi there! I’m new to the X-Carve, but I have a Glowforge, so I’m not new to the use of .svg’s, but when I import files into Easel Pro, areas that are not supposed to be carved away are showing as though they are. I’ve tried saving the files different ways, and even fully redrew files, but nothing is working. Here’s just one of the files I’m trying to get to work. As you can see, it wants to carve out everything, not just the background, and leave the letters and cake. Might help to share offending SVG as well. You had everything set as fill, not sure you can do much with that file though. It needs to be separate elements and everything is combined as one. Thanks for all of your help, and info guys. 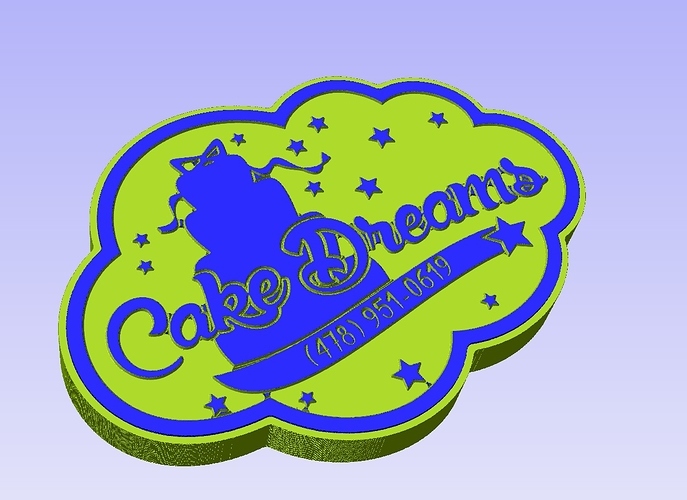 I guess I’m just used to doing everything in one flat layer for the laser. So if I understand correctly, on something like this, the cake and words would be a layer, the outline would be a layer, and the background would be a layer instead of a cutout, with nothing there? It’s not the layers that matter, it’s the paths. You need your detail to be a different path than the cloud surrounding it. If you share your SVG again (looks like you removed those posts), I’ll show you what I did with the one I sent you. Sure thing @NeilFerreri1, lemme see if I can figure out how I did that again. You can just drag it into the reply. They might come in REALLY small, and you can either change the dimensions in the tag or I’ll just know it’s there. I used the app “Shape Exploder” to break everything up, set the correct depths. Then i had to work on the “ream” part of Dreams to fix the open path issue. That’s fantastic @EthanKinney, thank you. Can I ask what the issues were? I’ll definitely try the Shape Exploder app too! This is one I’m trying to work on, following what @NeilFerreri1 said. What I’m not understanding is how on the cloud one, the background area is transparent on what he sent back, which is exactly the way I would think it would be, but not what the lady I spoke to with Inventables said, she said each piece should be a layer, which kind of makes sense, but then again, it doesn’t. My thought is, if I don’t want an area to be cut away, then it should be blank (transparent), and whatever I have as black, would be carved away, like the Cake Dreams logo. 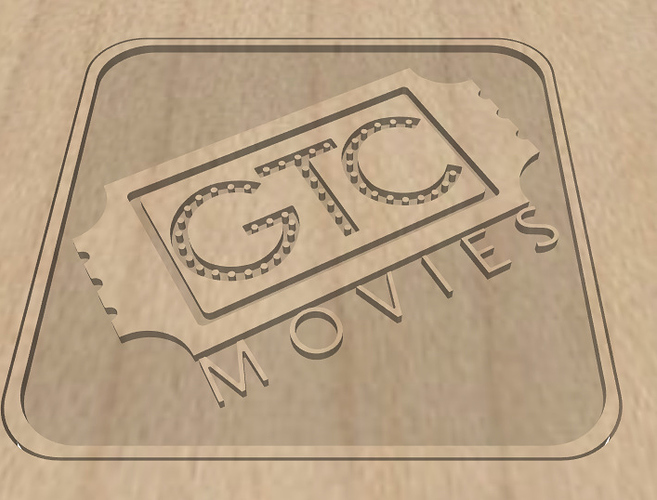 In trying that on this GTC logo, where I want it to have a raised border that is material height, carved pocket for the background, ticket raised with carved interior rectangle, and carved away letters, with raised dots inside the letters. If that make sense, but when I work on it, I can use the way the Inventables lady said, but the letters don’t show as a separate piece from the ticket. I’m sure somewhere, or at some point I’ll have that “A-HA!” moment, but right now I’m just not grasping it. It doesn’t need to be transparent, it can also be white. The darker the color, the deeper the cut. White = 0 depth, black = material depth. Yes the letters are not separate from the pieces. Again i used the shape exploder to break everything up, then set the appropriate depths as you described. What’s happening is when you have your svg, you have a path element that actually contains multiple paths inside of it. When easel imports this it keeps all of the paths in the same selectable shape. The reason it looks right when you just view the svg has to do with the path direction OR the fill-rule for the path. In this case your svg uses the fill-rule:evenodd, which Easel seems to ignore this and imports every path it sees as solid if the paths are not reversed. For instance the letter “O” has two paths, an outside and an inside path. usually the outside path will be clockwise and the inside will be counterclockwise. OR it will have the style of the path use the fill-rule:evenodd. This renders a black ring that we see as an O.
Joni Trythall demystifies using the SVG fill-rule property, and how it can further define our intentions for what is to be considered the inside of a shape. Again, easel seems to ignore the fill-rule and uses the path direction to determine the shape. Long reply, but should explain what you’re seeing. I don’t know if this’ll make sense, but all you really need to do is break the combined paths apart. Then you can combine the paths that make sense to combine. The two paths that make an ‘O’, the letters GTC (beacuse they’ll all be part of the same thing), all the little dots (so you don’t have to select each one in Easel). It takes a bit of work in Inkscape, but once you’ve done it a few times, you’ll get the hang of it. I think what Inventables support is telling you is that SVG has a positioning order. I guess you could use “Layers”, but I always just move stuff “to front”. I start with the path that will be underneath everything. In your case, thats’s the largest square. I bring that to front. Then I do the next biggest square, then the ticket, and so on until I bring the dots to front. In order to do this, I remove all Fill in Inkscape, so I can see the paths. Otherwise, they start to cover each other up. Bring into Easel and start setting them to fill with alternating depths.